So, my brain is totally fried and all I can think about is why in the name of all things holy did TBS start running old episodes of Two Broke Girls instead of the steady stream of Big Bang Theory episodes that I love (and have memorized). 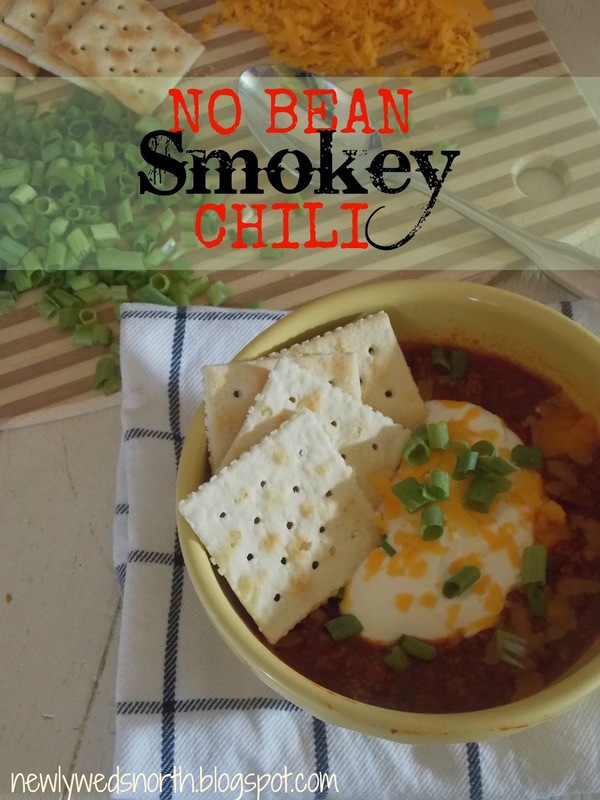 Because I'm worthless and serving up a drought of entertaining content, I thought I'd dig through the archives and find my famous no bean chili recipe for your viewing pleasure. You're welcome! The funny thing about chili is that it's usually loaded down with beans and sadly, I'm not much of a bean girl. Like, I hate them. All kinds: kidney, black, re-fried, Lima, you name it, I cringe at the thought. With that being said, it took some major Pinterest research to find a bean free Chili recipe that didn't require two thousand ingredients and 14 trips to the grocery store. Finally (and thankfully), I stumbled upon this recipe from This Gal Cooks. After a quick once over, the recipe seemed reasonably doable and while it took me forever to find those damn chipotle peppers in adobo sauce at my local Hannaford's, the rest of the grocery list was pretty simple and store brand/budget friendly. In all honesty, this recipe was super easy to make...you basically brown the hamburger with the chopped onion and jalepeno and then dump the rest of the ingredients into the pot. I was surprised that the recipe called for cocoa powder! Here's a tip for choosing the beer that you use in the chili: make sure that it's one that you like because you'll only need half a cup and you're obviously going to need to finish the rest. You don't even have to bother with any particular order of the dumping and to be honest, I didn't even bother to measure the spices before I tossed the into the pot. Pro Tip: if you have anyone in your family who does not like spicy foods, go ahead and measure. The last time I didn't bother to measure, I heard about. And ate the entire batch by myself. Sorry not sorry. The recipe also recommends that you simmer the Chili for at least an hour - I'll cop to both letting mine simmer for 20 seconds and a full 2 hours before diving in, Frito first. But if I'm being honest, I prefer my chili served with Frito scoops, too much sour cream and all of the cheese. Green onions are only good for making me feel healthy while smashing an entire bag of Fritos. Yields: a big pan full. Any color onion can be used to cook with the beef - sometimes I use whatever I had laying around and end up with both red and white tossed in the pan. If you give it a sample while it's simmering and you think it's too spicy for your family, add a little bit of sugar, stir and taste again. I just made a batch that had quite a bit of extra sugar and I liked the sweet taste with a slightly spicy kick. cocoa powder and beer? Sounds like an awesome recipe!